Gender equality is a moral and a business imperative. But unconscious bias holds us back and de-biasing minds has proven to be difficult and expensive. Behavioral design offers a new solution. Iris Bohnet shows that by de-biasing organizations instead of individuals, we can make smart changes that have big impacts—often at low cost and high speed. 5.0 out of 5 starsIf you work with women, read this book. This is a book I wanted to write. Evidence based, real world tactics and strategies for making workplaces more fair to women. In 2016 women still earn far less for equal work, and this book explains why that's been so hard to fix, how women can get a fairer shake, and how leaders can make a difference. I ran a company and wish I'd had this book before learning so many of its lessons by experience. Should be considered required reading for any individual or organization that trying to improve diversity and equality. Backed with years of in-depth research in a easy read format, this book does not dissappoint. 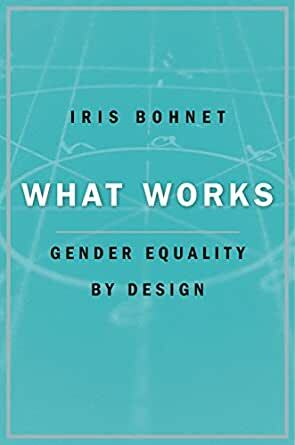 This book is pretty thorough - Iris Bohnet has vast experience in her research and backs it up! If you want to know the reality about Gender Equality I highly recomend you this book. On Point. 5.0 out of 5 starsAn outstanding perspective on the conditions that create bias and reasonable strategies to change! Very readable and sound in scientific substantiation. 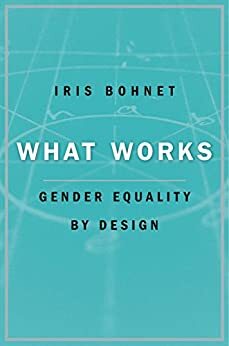 Highly recommended for a good perspective on gender bias with practical remedies for change.